Justin A. Cohn | The Journal Gazette Colin Chaulk's No. 91 is raised to the rafters at Memorial Coliseum, though the number was accidently unveiled upside down at Memorial Coliseum on Saturday night. While it may be true the Komets' relationship with Colin Chaulk has been a bit strained since he retirement – it's well known that he wanted to coach here after his playing days were done – it was both predictable and disappointing to hear and read the chatter that the events of Saturday night were somehow done on purpose by the Komets. If you've been completely off the grid and somehow missed it, the jersey retirement ceremony for Chaulk on Saturday had some uncomfortable moments because Chaulk's banner was unveiled upside down – the No. 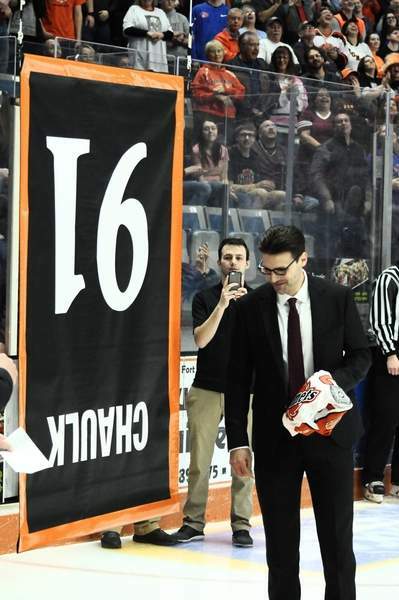 91 was therefore a 16 – and raised to the rafters that way before it was fixed for the second period of the Komets' 4-3 overtime victory over the Brampton Beast, the team Chaulk now coaches. I've spoken to people with the Komets and Memorial Coliseum. This was an unfortunate mistake by the Coliseum. How can I be so sure? Because the Coliseum is very diligent in making sure that no one is allowed up in the catwalks. Believe me, our photographers have tried. Even I was initially in the camp of thinking: even if it was a Coliseum error, the Komets should have checked to make sure everything was OK. But that's easier said than done. And even if you think the Komets and the Coliseum should have practiced the entire ceremony before the game, on the off chance that an already approved banner wasn't hung correctly, to think the Komets want to get national attention for disrespecting the greatest player of the last 20 years is pretty ridiculous. Or, to think that someone from the Coliseum would do it on purpose to make some sort of point, when it would possibly put their job in jeopardy, is also ridiculous. A lot of people have asked me why, once they uncovered the banner, did they still choose to raise it upside down? I was on the ice, 30 feet from the banner, and I can tell you they were trying desperately to fix it before it went up. What I was told today is that the banner has special locking bolts –presumably to make sure they don't ever fall on the fans – and that it would have taken some special tools to fix it. The president, general manager and communications director of the team wouldn't have had those on them, of course. It's easy for me to say, because I wasn't having a number retired, but I think you have to have a sense of humor about the whole thing. And you have to remember what the whole event was about – honoring Chaulk. If you saw the smiles on his daughters' faces, they were the most thrilled people in the building. Although the best line I heard all night was this from Kent Hormann: "The happiest person in the building was probably Eddie Long. He got his No. 16 retired a second time." Also prophetic: the Beast scored 16 seconds into the game.